K’jipuktuk (Halifax) – Since its release in April, staff and volunteers at the Ecology Action Centre (EAC) have been carefully reviewing the Draft for the Centre Plan. In the new report, released today, Sustainable Cities Coordinator, Jenny Lugar, says the draft is not bold enough to protect culture and heritage in the Regional Centre, while encouraging adequate density to improve our growing city. “Based on this Draft, we stand to lose some of the culture, affordability, and heritage in the built environment that makes Halifax and Dartmouth a destination for tourists while still remaining an affordable city with great quality of life for young people and families,” says Lugar. 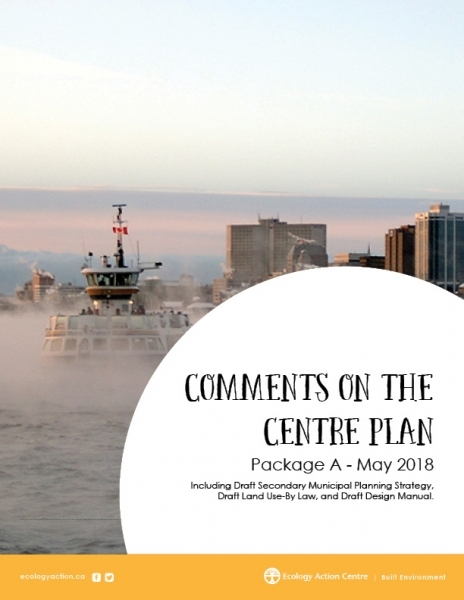 Package A of the Centre Plan includes new rules that will help decision-makers to approve developments and increase density in the Regional Centre. But Lugar says many of these designations have missed the mark in terms of detail. “The attention to character on beloved streets like Gottingen, Agricola, Quinpool, Coburg, South Street, and many others is missing from these new rules. Likewise, protecting existing affordable housing and the need to provide amenities to under-resourced communities just isn’t there for the Centres or the Corridors,” explains Lugar. The EAC has been advocating for a Centre Plan that will encourage sustainable growth for more than four years. The report released by the EAC includes further detail on the directives of the Centre Plan Draft, outlining how the vision for our Regional Centre needs to remain strong and consistent throughout the new policy. The report also offers recommendations to HRM staff for improving Package A and includes topics for engagement for the general public. “In Halifax, we seem to still suffer from Nova Scotia’s Provincial have-not syndrome, a mindset caused by being one of the less-wealthy provinces in Canada. This has resulted in our acceptance of, and indeed, promotion of meeting the bare minimum of success; in this case, it has allowed “Growth at all Costs.” The Centre Plan must do more to combat this attitude by raising the bar on what constitutes good development that builds complete communities and improves the lives of all residents,” Lugar says. The Centre Plan will return to the Community Planning and Economic Development Standing Committee of Council in Spring/Summer 2018. Read the full report here. The Ecology Action Centre is committed to sustainable growth for the creation of a more environmentally-friendly city in the Regional Centre of Halifax Regional Municipality (HRM). The Centre Plan, which aims to determine how and where the next 18,000 units will be located, is integral to the development of greater density in the Regional Centre and we applaud the work that has gone into achieving this goal thus far.